What’s special about a string of tiny stars? LOTS! 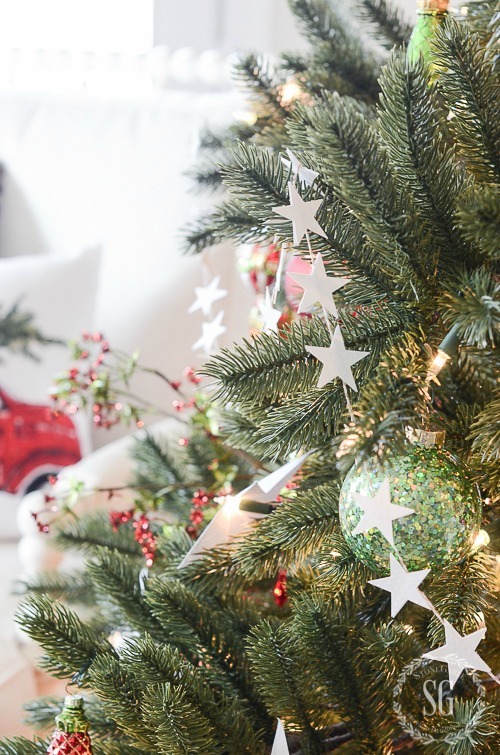 These simple stars add so much fun and flair to my Christmas decor! And here’s the best part of this garland… they are not just for Christmas! 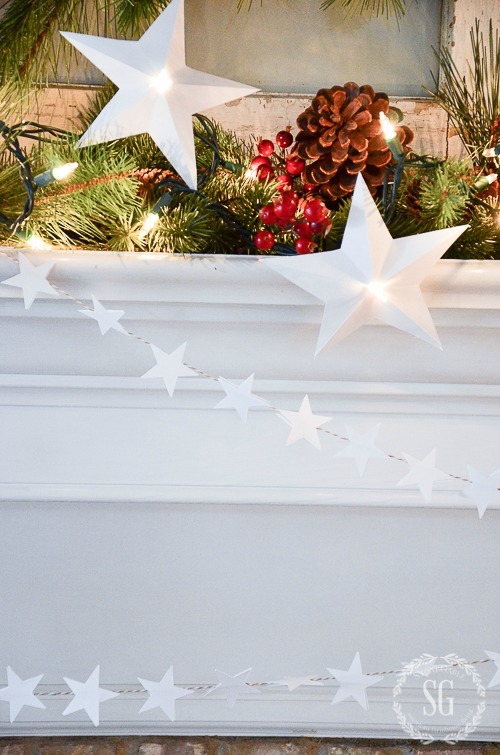 Once you have this star studded garland it can be pulled out and used to embellish your home decor almost any time of year! 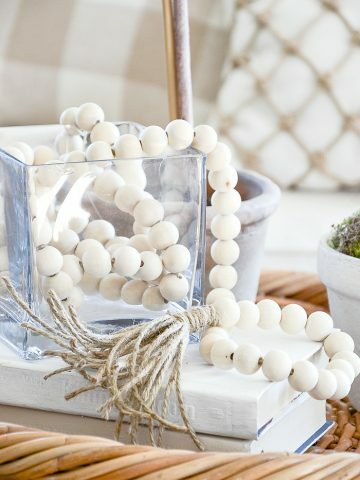 I love projects that can be used more than once! 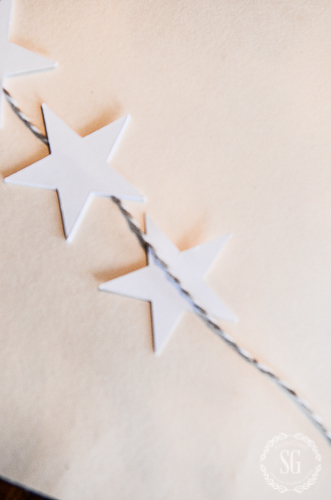 Star garland is super easy to make too. Here, I’ll show you how! I used my Cricut cutting machine to do this. You could also use a star punch, but invest in a Cricut… you can do so many cool things with it! 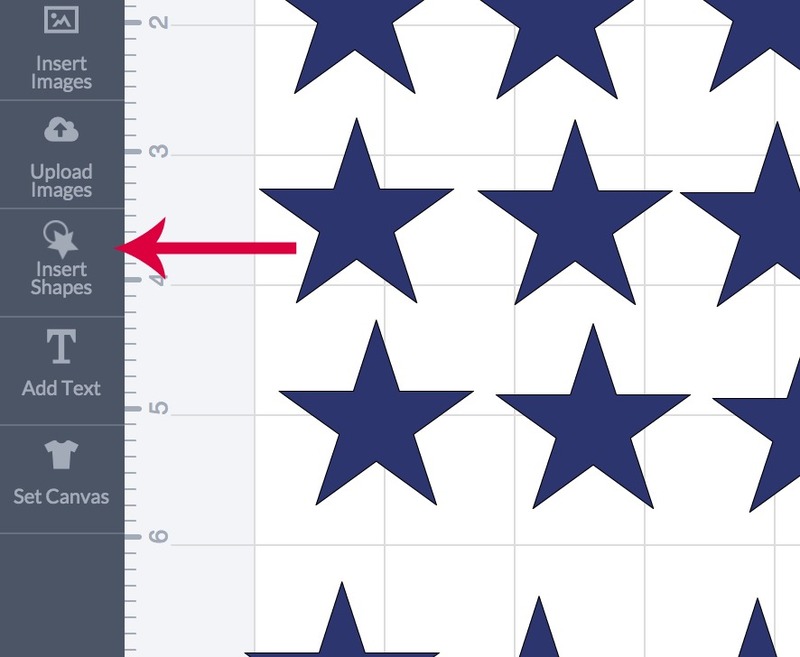 You can create stars using the”Insert Shapes”. I made my stars about 1 inch high. Then I copied and pasted lots of them on the page. 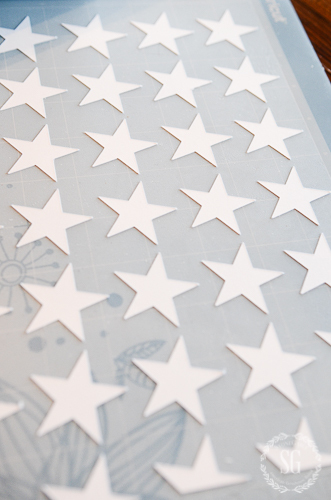 Here’s the cute little stars right out of the Cricut machine and ready to be taken off the sticky mat and made into a garland. Put glue on a star with a glue stick. Lay the twine down on top of the glued star. Top with another star. Align stars. Repeat. The process goes fast! I made my star garland while watching the news in the evening. When it’s time to take down the garland roll it onto a paper towel roll so it does not get tangles and you can use it again! 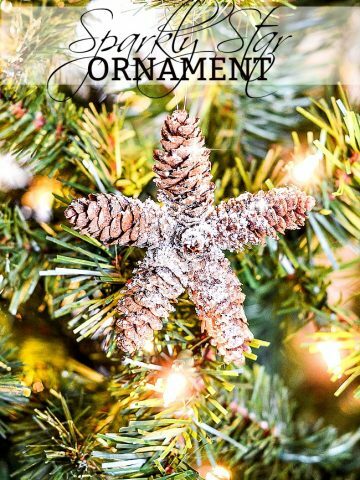 This is such an easy peasy and inexpensive way to bring a little star power to your Christmas decor! You might want to follow me on Pinterest and see all the fun things I’m finding to pin daily HERE. Did you know that I have a very active Facebook page? You can visit me there and weight in on the posts! Click HERE to join in! 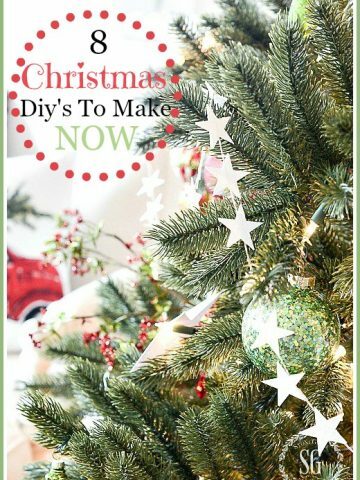 8 CHRISTMAS DIY’S TO MAKE NOW! The star garland is so cheery! I love everyone’ s comments too on how they plan to use their star garland. 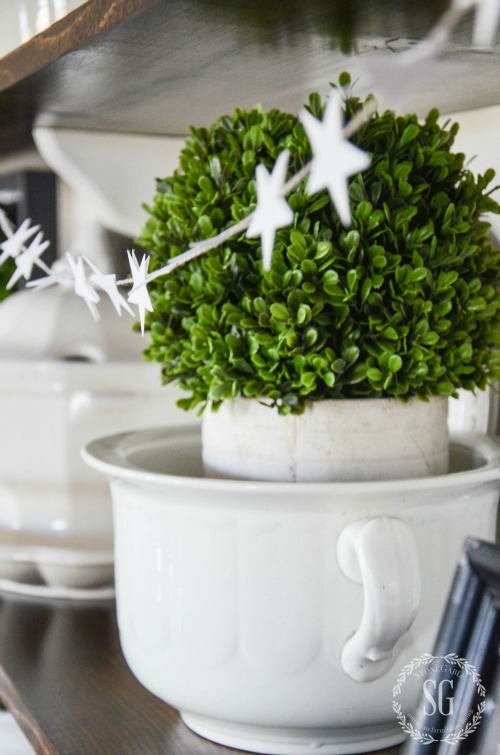 Thank you for sharing the steps to create a lovely addition to our Christmas decor. Another winner! So simple, but so darling – & so versatile. Thanks! Hi! LOve all of your ideas! Was wondering if u have a post about how to decorate kitchen counters? What do u usually have on the countwrs year round and at Christmas? Love STARS !! Crazy about all kinds of garlands. They always add so much to any holiday. Love your page. 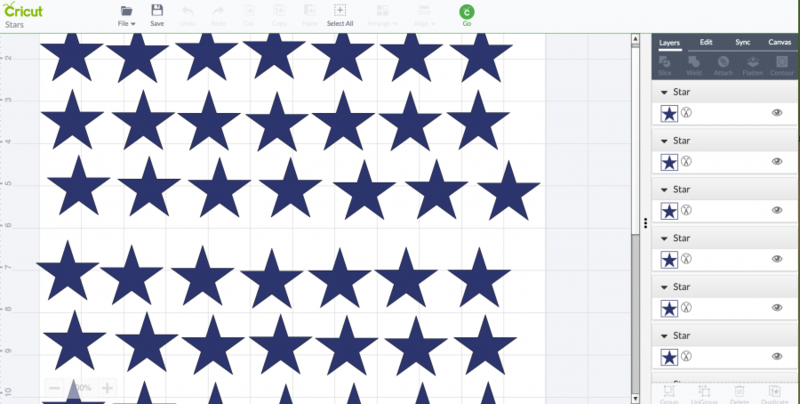 This star garland would look awesome in a Christmas plaid paper too! Love it! Thanks for all the holiday ideas Yvonne!! I plan to use this craft for my women’s Bible study Christmas party! Thank you for the idea. 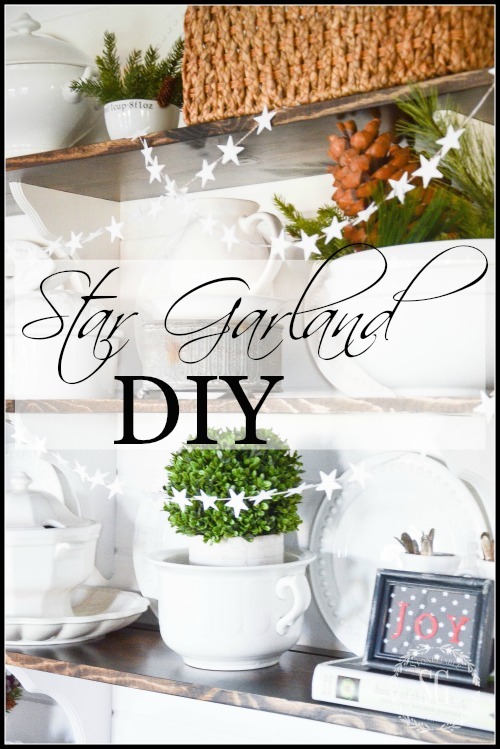 Everyone can use a star garland no matter what time of year it is! You are so right, Anita! Adorable! I don’t have a cricut but I do have a star punch! Thank you for another great idea. The star garland looks so pretty. Fun crafting! Thank you for all your creative ideas, I love your blogs,always look forward to reading what you post!!!! Sweet! 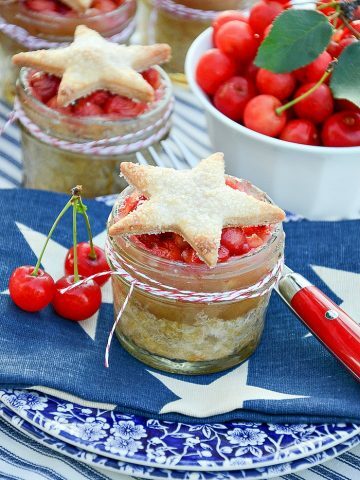 Stars are very appropriate for the star of decorating! I’m all about icicles this year, so frosty looking on my tree. Think I need more! Merry Christmas, thank you for sharing your ideas, faith, and enthusiasm for life. I too, look forward to each of your posts! With the busy days ahead I wanted to take the time to wish you and yours a very Merry Christmas!! Stonegable is my favorite blog ever!! I look forward to it every day and you inspire me everyday. Love all of your decor and ideas. They are all so helpful and fun! I look forward to another year of being part of the stonegable family. Thanks for all of your hard work for us all!!! What a nice comment to read, Debbie! Thank you so so much! I’m thrilled you are enjoying StoneGable! Merry Christmas to you too! Great idea – have all the supplies needed – now get it done. Thanks for the idea. Love the garland! I’ve been giving some serious thought this past year to investing in a Cricut machine. I follow Anna Griffin and her crafting on HSN, and she has a lot of Cricut items. This star garland is precious! You’re right, you could use it all year long. I also want to wish you a very Merry Christmas, to you and your family! Thank you for what you do, you brighten my mornings every single day of the year. Thank you so much Karen, Merry Christmas to you too! And thank you for being such a big part of StoneGable! I love to see that you have commented! You are truly a faithful follower of StoneGable! Yvonne, these stars add so much and a personal homemade touch to your already beautiful decor. Am I missing something? Are you double staring these or putting one star in one direction and another in another direction. Can’t tell from the photo. I would guess the stars are back to back incase the string turns. Love this idea. Oh they are so cute..I would like to get a Cricut but I think I would have to quit my day job!!! HaHa! Once again, thanks for showing use such neat ideas to decorate our home. Me too, Caroline! I don’t do that many paper projects anymore, now live in a condo with, naturally, no basement to store things (sob!) so I will just have to cut these out by hand! Here in Canada, those machines are half your dollar amount again. However, I’ll still make this pretty garland. I might dress mine up a bit more with just a touch of glitter here and there but then again, it’s probably wise to leave it plain so it can be used throughout the year. I bought a star punch at a hobby store for$10.